The Derating Analysis software module is used to analyze the overstressed components under current temperature conditions. 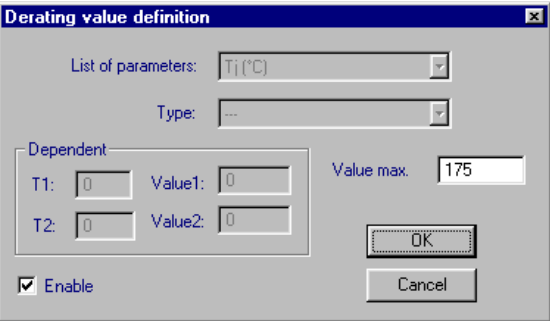 The module provides a tool to define Derating curves and identify overstress of components, i.e., those working under stress exceeding the specified rating value, as you can see in the “Derating Value Definition dialog box” below.The rating, or maximum rated stress, is the specified value of temperature, voltage, power or current that defines the absolute maximum stress limits. Exceeding these values creates a high probability of part damage/failure. The maximum rating is specified in the part specifications or in the standard for this type of part. It is a well known practice in many companies to define limit stress values for various components as a function of the temperature. These limits or “Derating curves”, are part of the company policy of component usage. A report created by the “Derating Anaysis module” includes all components in the selected part of the system, or only the overstressed ones.